In each level of this colorful and very interesting online game the gamer will have to be very fast to use the mouse clicks to pop way the bubbles to score as many points as possible. 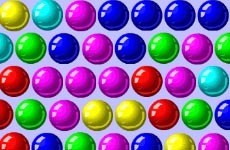 The game is fun to play but the lives are limited and hence the bubbles should not be allowed to increase in number. There are some special bubbles that will help your cause. All the best!